Philip J. Rifenburgh - Howard B. Tate & SonFuneral Home, Inc.
Valley Falls- Philip J. “Phil” Rifenburgh, 71, “The Redneck on the Hill” a lifelong resident of Pittstown, died suddenly Friday, March 29, 2019, after being stricken at his residence. Born in Tomhannock December 24, 1947, Phil was the son of the late Gordon and Elizabeth (Peters) Rifenburgh and for over 51 years the devoted husband of Lois E. (Norton) Rifenburgh of Valley Falls, who survives. Phil attended Hoosic Valley Central School in Schaghticoke. As a younger man, he worked with his brothers on Rifenburgh Water Well Drilling and was employed for over 16 years as a track maintenance worker by the B&M Railroad working from the Mechanicville train yard. More recently he was employed as a heavy equipment operator by the Town of Pittstown Highway Department. For 25 plus years he helped to maintain the many miles of the town’s gravel roads operating the grader with a precision and expertise not matched since his retirement in August 2013. Phil was a member of both the Green Island and North Troy Stag, Rod and Gun Clubs and was an avid outdoorsman, enjoying turkey and deer hunting. He was a former member of the Tomhannock Methodist Church. Phil was known for his good natured ribbing and wise guy remarks. 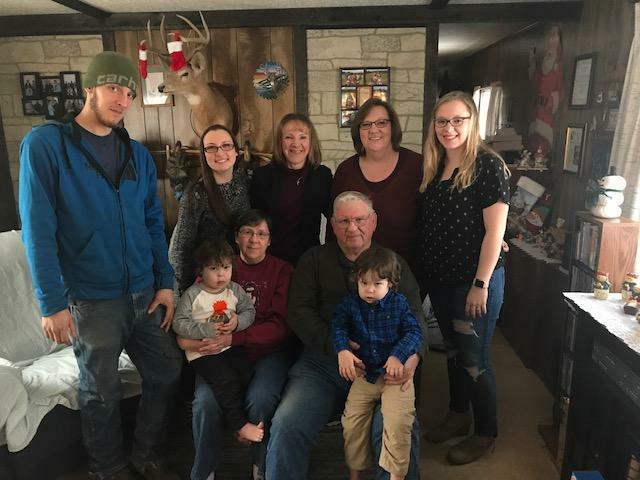 In his quiet time he enjoyed watching hunting videos and old “western movies,” and especially cherished spending time with his beloved grand and great grandchildren. In addition to his wife, Lois, he is survived by two daughters and their husbands, Melissa M. and Brian Wilber of Greenwich and April L. and William Castle Jr. of Averill Park, three grandchildren, Christopher Wilber, Hannah Wilber, and DeLana Castle, three great-grandchildren, Hunter Wilber, Parker Wilber, and Owen Best, a brother and a sister, several brothers and sisters-in law and several nieces, nephews, and cousins. In addition to his parents, he was predeceased by six brothers. ​A celebration of life service for Phil will be held on Friday, April 5, 2019, at 7:00 p.m. at the Howard B. Tate & Son Funeral Home Inc., 2237 New York Route 7 in Raymertown with Rev. Patricia Bush officiating. Relatives and friends are invited to call at the funeral home on Friday from 5:00-6:45 p.m. prior to the service. Burial will be private at the convenience of the family. Memorial contributions, if desired, may be made to Susan G. Komen Fund, 501 New Karner Road, Suite 2B, Albany, NY 12205, in memory of Philip J. Rifenburgh.